Sherman Alexie’s “Terminal Nostalgia” was originally published in the Spring 2011 issue of the Green Mountains Review. It was then reprinted in the 2012 volume of Best American Poetry. Alexie was born in 1966 and grew up on the Spokane Indian Reservation. His most recent work is in the poetry collection Face. His poem “Terminal Nostalgia” is about people reminiscing on the “good old days”. It mixes nostalgic feelings of Americans as well as Native Americans. The poem is meant to mock American nostalgia because it is such a young country. He believes that because of the internet culture of today and the ever changing pop culture, people who are sentimental about the “better days” from their times are actually just pretentious. American’s are overblowing historical and national pride. As for the Native American aspect of the poem, it relates to romanticizing pre-Columbian culture. Alexie wrote “Terminal Nostalgia” as a ghazal, which is a seventh-century Arabic poetic form, to be a humorous poem, but he believes the end result is funny yet sad at the same time. The first time I read Alexie’s poem, I was immediately hooked. It took me a while to figure out what it actually meant, but I was fascinated by the language and examples used. I thought it was a really interesting view on American pop culture by using actual references that I understood. For example, he writes “Every ball game was a double-header. 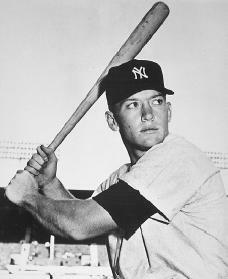 Mickey Mantle was sober.” I was amused by his Mickey Mantle reference because of the humor that comes along with it. Most people would not see this as poetic language, but I think that the comical tone and the references to modern America make this poem “great”. Alexie also tries make this poem funny by repeating the line “So was the weather” or “So did the weather” after every couplet. By doing this, he compares the weather with very unrealistic things. The characterizations of the weather as “sober”, “lived in the moment”, reading “more poetry” and many others are supposed to be comical as well as ridiculous. I feel like those attributes make the poem more interesting to everyday people who normally see poetry as serious or boring. This poem redefines the stereotypes of how formal poems are supposed to be and what they’re supposed to be about. I also like how this poem mixes American culture with Native American culture because it makes an interesting comparison in the nostalgia that both cultures deal with. Alexie makes the perspective from both cultures seem somewhat ridiculous with his language. For example, when dealing with American nostalgia he says that “the cattle were happy to be leather and made shoes that fit.” That line is supposed to be sarcastic because, obviously, cattle were not happy to be turned into shoes. He uses such comical lines like that to show how nostalgia about the “good old days” asserts pretentiousness. People always think that things were much happier in their time, everything was perfect, and no one was struggling. Those people view their times as superior to the younger generations. He also makes fun of nostalgia of Native American culture by saying things like “Before Columbus came, eagle feathers Gave birth to eagles.” The absurdity of the line teases Native Americans and how they long for the pre-Columbus days. The thing that makes the poem good to me is how outrageous the lines are, and how Alexie uses this sarcasm to show that nostalgia is so overblown by today’s culture. To me, this poem is not all about the lightheartedness or the comical tone which I’ve talked about thus far. I think there are other emotions hidden under all the nonsense in this poem. My first reaction to the poem is that it is funny and witty because of some of the odd lines or the repetition of “so did the weather”, but after reading it many times I got the sense of sadness lurking underneath everything else. These emotions mostly come from the lines relating to Native American nostalgia. Alexie being Native American and growing up on a reservation is most likely emotional about the way Native Americans were marginalized and mistreated when settlers came to their land. The feeling of sentimentality of pre-Columbus days probably comes from his ancestors and the stories passed down by them (being that Alexie did not live during that time period). Lines like “Indians were neither loaners nor debtors. Salmon was our money” and “We all apprenticed to wise old mentors And meditated for days” do not bring humorous tones, but describe that before Columbus and the settlers, the Native Americans lived in happy peaceful times. Then this was all disrupted. The dismal meaning behind these lines are mostly hidden by the tones of the rest of the poem. I think the sad undertone actually makes the poem quite depressing. I like the mix of emotions, however, because I think a great poem should make a person feel a whole range of feelings while reading it. In the Contributor’s Notes and Comments in the back of the 2012 Best American Poetry book, Alexie writes that the result of his poem “Terminal Nostalgia” is “funny and sad at the same time, although, when I’ve performed it live, it seems that people are afraid to laugh.” This is interesting to me because Alexie is trying to poke fun at the pretentiousness of the people who are nostalgic and tries to do so in such a ridiculous and humorous matter. So I wonder why people are afraid to laugh. Maybe those people heard the same sad undertone as I did after examining the poem. This poem has the ability to bring different emotions to each of its readers. Whatever causes people to be wide-eyed and silent over this poem, I think it makes this poem shocking yet insightful with a mix of lighthearted humor.